These outfits will get your family ready for the summer. It's a match made in heaven — or at least a match good enough for a family photo. Target has debuted matching outfits for families that are both fashionable and affordable, with no item costing more than $50. The tropical outfits come courtesy of the Genuine Kids line from OshKosh. Among the highlights is a palm print set of dresses and shirts that range from $10.99 for young boys to $27.99 for their moms. There's swimwear that includes yellow floral print one-piece suits for ladies of all ages. The boys in the household can wear matching board shorts. Target has long been a destination spot for bargain-seeking parents shopping for children's clothing, and OshKosh has been adding to the Genuine Kids line for a while. But this foray into adult clothing is a new wrinkle. 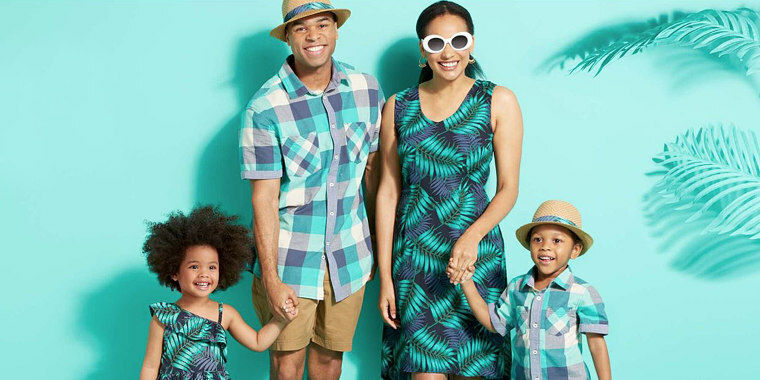 You can check out Target's tropical new looks for the family on its website. TODAY has affiliate relationships, so we may get a small share of the revenue from your purchases.